I am so proud of this piece! I went a little crazy on it but that’s just how I do when doing something. Gotta give it my all. Our assignment was we needed to choose a scene from our favorite movie and create a Sin City style Noir Black & White High Contrast picture. We could only use a black ink pen. Obviously Aliens is my favorite movie of all time and I have always thought the Alien was just an amazing looking scary as hell creation. I wanted to try to get that effect while getting that high contrast. Here is the timeline process of how this piece came to life. 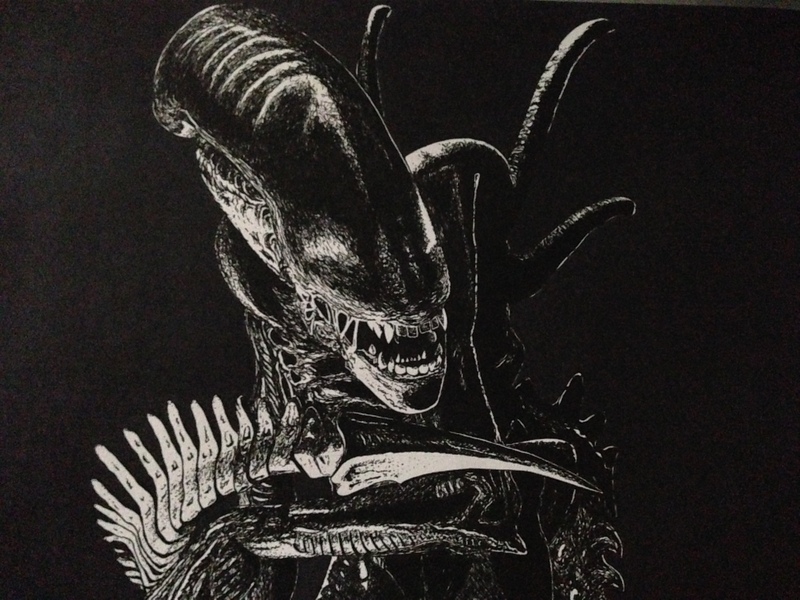 Posted on November 9, 2013, in My Art Work, News and Info and tagged Alien, Aliens, Art, Art 1, Bachelors Degree, Back to School, Class of 2016, College, College in my 30's, College Life, Drawing, Full Sail, High Contrast, Noir, School Supplies, Sean Korb, Sin City, Success, Thirty Something, University, Video Game Art, Xenomorph. Bookmark the permalink. 1 Comment.